Tony Blair has no desire to quit any time soon. And when he does resign, it will be in his own time and his own way. Those were the conspicuous messages he sent out today in his sweeping reorganisation of the Cabinet. Or to put it more bluntly, he blew a mighty raspberry in the direction of Number 11 Downing Street and the Chancellor of the Exchequer. 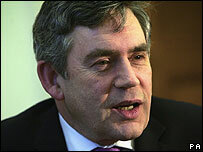 There was no consultation between the Prime Minister and Gordon Brown on the reshuffle. However an absence of communication between the two of them is par for the course. 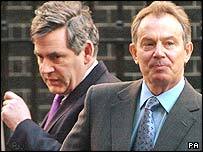 More relevant is that Mr Blair made no gestures in the direction of engineering a smooth handover of power to Mr Brown, which is what he implied he would do, shortly after the last general election, in a meeting with the Parliamentary Labour Party. For the Chancellor, the most important and inflammatory of today's appointments were of Jacqui Smith as the new chief whip and Hazel Blears as chairman of the Labour Party. Holders of these posts play a vital role in reading and influencing the mood of the party in Parliament and in the country. So Mr Brown would have expected the appointees to be neither fanatical Blairites or committed Brownites, to be impartial facilitators in the transition from Mr Blair to his eventual successor. However, Mr Blair opted instead for loyalists: both Ms Smith and Ms Blears are widely viewed as enthusiastic cheerleaders for him. 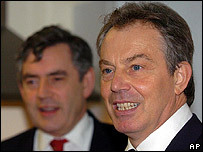 Blair v Brown: A dysfunctional relationship? The Prime Minister was equally provocative to Mr Brown in the promotion of John Reid to be Home Secretary, in that Mr Reid has been the most explicit of any Cabinet member in calling on Mr Blair to remain at Number 10 until as close to the next general election as possible. As an aside, that appointment may also rile English nationalists. Slightly misleadingly, the Home Office is widely seen as an "English" department and there has not been a Scotsman at the Home Office since Willie Whitelaw in the early 1980s. Anyway, this is not to see the reshuffle as a mass purging of the Brownites, just as an attempt by Mr Blair to engineer a shift in the balance of power in his direction. Thus the demotion of Jack Straw, who has moved closer to Mr Brown in recent years, can be seen as damaging to the Chancellor. His successor at the foreign office, Margaret Beckett, is a rare example of a Labour politician who keeps both Mr Blair and Mr Brown at arms length. Meanwhile the Deputy Prime Minister, John Prescott, had set himself up as the keeper of the Labour flame who would ensure that Mr Blair would quit in good time before the next election. However, he is now viewed by the Brownites and Blairites as more or less powerless, following the recent humiliating disclosures about his office affair and Blair's decision to strip him of control of his ministerial departments. Even the promotion of David Miliband to become Secretary of State for the Environment, Food and Rural Affairs is viewable as a taunt to Mr Brown. Although Mr Miliband has been voicing great enthusiasm for Mr Brown as Mr Blair's likely successor, some of Mr Miliband's Blairite colleagues would like to see him challenge Mr Brown for the leadership, as and when Mr Blair resigns. In that context, the transfer to the youthful Mr Miliband of the environment portfolio will be interpreted as Mr Blair setting him up as the apprentice leader: more than most ministers, Mr Miliband will henceforth be leading the battle against the Conservative leader, David Cameron, who has been rebranding the blue Tories as green. In other words, Mr Blair has been uncharacteristically bold in trying to exert his authority in this reshuffle. I am told that he regards Labour's lousy local election performance as a better result than it could have been, which is precisely the same view he took of the 2004 local elections and which prompted him back then to change his mind about stepping down before the 2005 general election. Mr Blair is once again telling Mr Brown and his supporters to like his continued leadership of the party it or lump it in silence. He is gambling on their reluctance to damage their party through engaging in open warfare against him. Up to now, Blair has always won such bets. The coming few days will show whether he is at the end of his winning streak.